Oracle is an enormous system, with myriad technologies, options, and releases. Most users-even experienced developers and database administrators-find it difficult to get a handle on the full scope of the Oracle database. And, as each new Oracle version is released, users find themselves under increasing pressure to learn about a whole range of new technologies. The latest challenge is Oracle Database 11g. 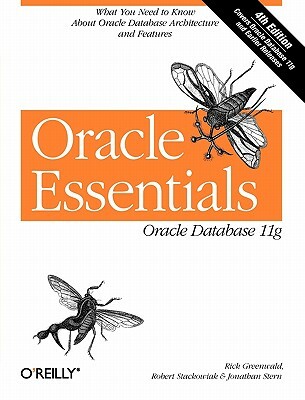 This book distills an enormous amount of information about Oracle into a compact, easy-to-read volume filled with focused text, illustrations, and helpful hints. Rick Greenwald has been active in the world of computer software for nearly two decades, with stints at Data General, Cognos, and Gupta. Currently an analyst with Oracle Corporation, he's published six books and several articles on a variety of technical topics, and has spoken at conferences and training sessions across six continents. Robert Stackowiak is Senior Director of E-Business Intelligence for Oracle Corporation's Enterprise Technology Center. He works with Oracle's largest customers in North America, providing insight into the company's products and data warehousing strategy. Jonathan Stern has more than 13 years of IT experience, including senior positions in consulting, systems architecture, and technical sales. He has authored papers and presented at internal and external conferences on topics such as scaling with Oracle's dynamic parallelism and the role of reorganizing segments in an Oracle database.